One of the founding missions of the Kavli Institute for Cosmological Physics is to explore the highest energy particles from space to study their origin, and their implications to fundamental particle interactions, quantum gravity and the structure of space-time itself. 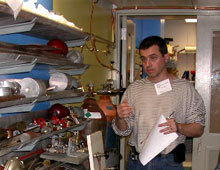 This research bridges the frontier between particle physics and astrophysics. Researchers at the KICP are using a variety of facilities to study Ultra-high energy cosmic rays and extremely energetic gamma-rays to gain insights into the highest energy processes at work in the universe and to indirectly study the nature of dark matter and its interactions. Several experiments are also being carried out which aim to directly observe dark matter particles in underground laboratories like the one 60 feet below the LASR building. These very energetic photons and cosmic rays as well as the direct detection of dark matter particles can probe particle physics phenomena that occur beyond the realm of the Standard Model of particle physics. Cosmic rays are not "rays" but highly energetic particles - protons and atomic nuclei and neutrinos- that are accelerated to very high energies by various possible astrophysical phenomena in the universe. For instance cosmic rays could be accelerated in the jets produced when matter falls onto supermassive black holes at the centers of galaxies. They could be produced in the supernova explosions that accompany the death of massive stars or in the still mysterious gamma-ray bursts, or by extremely magnetized neutron stars (magnetars). The Pierre Auger Project is named after a French physicists who was the first to realize that when an ultra high energy cosmic ray (UHECR) particle enters the earth's atmosphere its enormous energy is transferred to air molecules resulting in a cascade of subatomic particles that can be detected by photo multiplier tubes on the ground as an "air-shower". 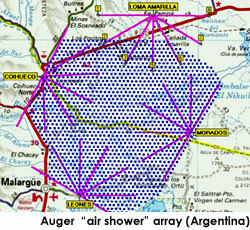 The Pierre Auger project is a set of two giant air shower arrays. The first is currently under construction in the southern hemisphere (Argentina) and a second one is planned for North America. When the southern array is complete this facility will comprise 1600 water tanks (surface detectors) covering an area roughly the size of Rhode Island (3000 square-kilometers). 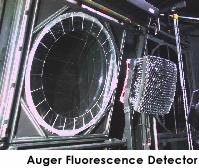 Auger also uses optical air fluorescence telescopes to track the developments of "air showers" through the atmosphere. 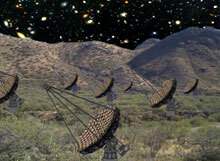 The combined ground array of fluorescence telescopes is the best tool to address the mystery of the origin of high energy cosmic rays. 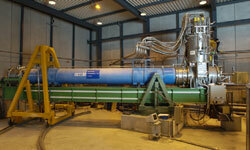 In addition, Auger will detect neutrinos through horizontal and upward going showers. Neutrino showers are among the best tools to study fundamental interactions at energies beyond what can be produced on Earth. VERITAS: This new major ground-based gamma-ray observatory is expected to be completed in 2006 and will comprise of four telescopes conducting gamma-ray astronomy in the GeV - TeV energy range. The array will search for the highest energy photons ever observed from astrophysical sources and including gamma-ray annihilation products from plausible dark matter particles. In 2004 three different groups including the VERITAS group have reported the detection of TeV gamma-ray radiation from the center of our galaxy, where it is believed galaxy formation processes have lead to the formation of a very dense nuclear "spike" of dark matter particles. Theory predicts that if the dark matter particles are the Weakly Interacting Massive Particles (wimps) they will annihilate each other producing gamma rays that can be detected by telescopes such as VERITAS. This project seeks to solve a 30-year-old riddle of particle physics by detecting axions originating from sun's core. Axions were proposed as an extension to the Standard Model of particle physics to explain why CP ("Charge-Parity") violation (a phenomenon linked to the dominance of matter over antimatter in the universe) is observed in weak but not strong interactions (the "strong-CP" problem). CAST will search for solar axions using a decommissioned test magnet from a previous CERN experiment call the Large Hardon Collider experiment (LHC). COUPP: The research efforts of this group are focused on the development of low-background devices and techniques for the direct detection of astroparticles. They include the development of WIMP detectors, which use the properties of superheated heavy liquids. KICP member Juan Collar's group has shown that small volumes of such liquids at room temperature can be used to make sensitive, low-background "bubble chambers" that are capable of being more sensitive than the most ambition cryogenic WIMP detection projects. In 2003-2004, the COUPP group has developed two different prototype detectors, which were completely insensitive to gamma radiation but highly sensitive to reactions that could indicate the presence of neutrons. The group has also been active in the application of new "Micropattern gaseous detectors" which are being tested for their sensitivity to coherent neutrino-nucleus scattering.